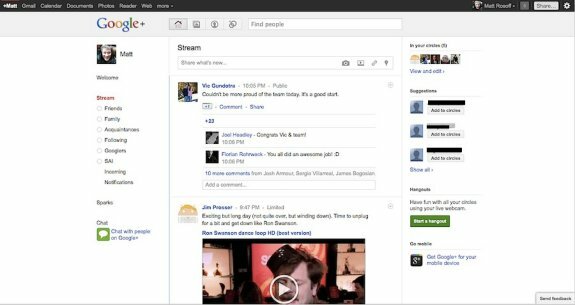 Google has rolled out Google+, an invite-only social networking service with four key features; Circles, Sparks, Hangouts, and Mobile. More details at DailyTech. Circles allow users to create multiple categories of family and friends, each within their separate circle. For instance, one circle can be the family circle, another can be best friends, another can be the basketball team you play on, and so on. This allows the user to share what they want with whom they want instead of sharing everything across the board. Sparks is an online sharing engine that allows users in certain circles to share information based on their interests. For instance, if you have a circle of friends that are into comic books, Sparks provides relevant articles, videos and photos that give you and your circle of comic book-loving friends something to discuss and enjoy together. It allows you to "spark" a conversation. It also filters and delivers the most "contagious" content on the web, so the need for time-consuming searches is eliminated.